Each Alpha Valve Spring is manufactured exclusively from super-clean, chrome-silicone wire milled in Japan. 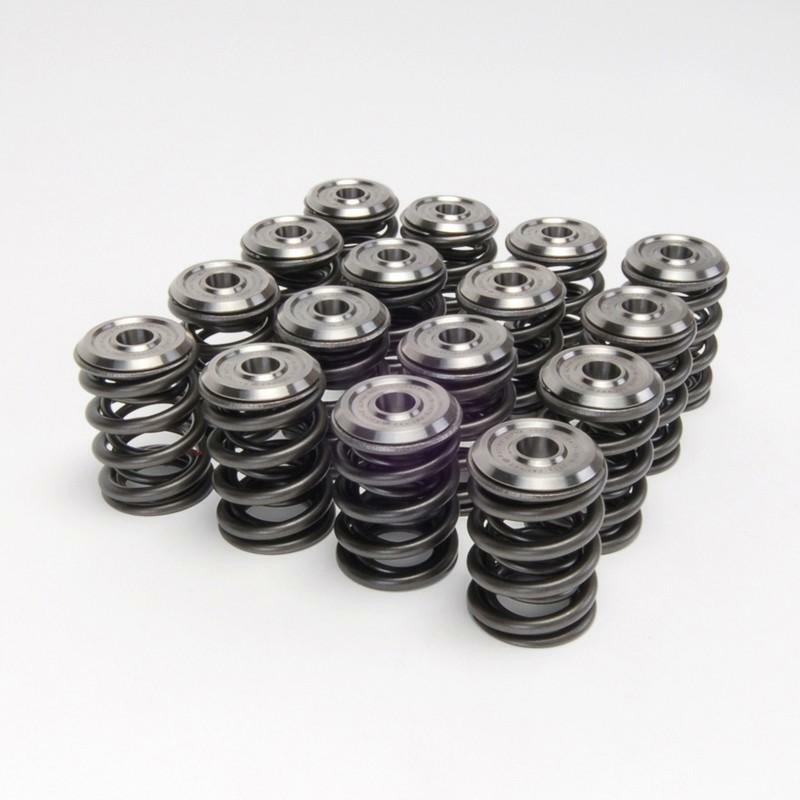 By using inner and outer springs mated together through a slight interference fit and with differing frequencies, Alpha Valve Springs are able to prevent valve float and maintain valvetrain stability at engine speeds in excess of 10,000 rpm. Skunk2’s industry-leading Alpha Titanium Retainers are designed to significantly reduce valvetrain mass, resulting in more horsepower and improved valvetrain stability. Similar to Skunk2’s already popular Pro Series Titanium Retainers, Alpha Titanium Retainers feature radius-cut edges for additional rocker arm clearance and reduced weight, strategically positioned lightening grooves, and reduced overall heights for better valve seal clearance and even further weight reduction. Alpha Titanium Retainers are manufactured using the latest 3D CAD (Computer Aided Design) and FEA (Finite Element Analysis) to ensure that each is optimized for strength as well as for reduced weight. Skunk2 engineers then test and prove their designs on the engine dyno as well as the race track. Once approved for manufacturing, only medical-grade titanium that’s been ultrasonically inspected and certified is used. Following CNC machining, each retainer is then individually inspected to ensure proper hole diameter, taper, and that each are free from machining defects to ensure proper installed valve spring heights and pressures. Finally, each retainer is serialized for your protection, including valuable information, like material batch specifics as well as production and inspection dates. Skunk2 designs, develops, and tests its entire valvetrain lineup in-house to ensure superior quality and maximum performance gains. During development, each valvetrain component is tested both on the dyno and the road, including 11,000 rpm drag racing engines and 17,000 rpm superbikes. Manufactured from the best materials available, Skunk2 valvetrain components provide exceptional performance, reliability, and quality and remain standard-issue on each Skunk2 vehicle that we build and support. NOTE: Skunk2 Alpha Series Valve Spring & Ti Retainer Kit are sold as complete kits, as a set of springs OR as a set of retainers. Please read the Notes on each item before completing your purchase.